:: Avoid combing hair with fine-toothed combs when wet, since this is a common cause of breakage. 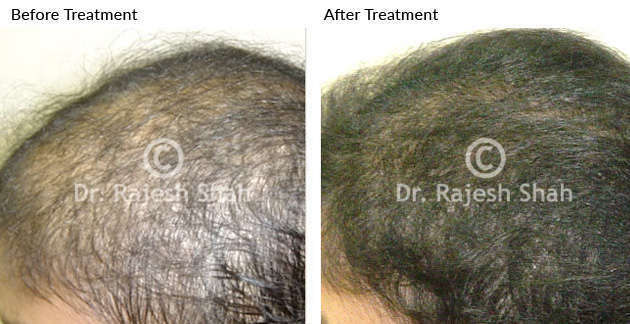 The stress on the hair shaft is immense when the hair is wet because it is weakened. :: Remember, over-combing or over-brushing generally will cause damage to the hair, which is quite contrary to the old 100-stroke brushing rule. :: Brushing the hair before washing can loosen up flakes of sebum and dead skin buildup and make it easier to clean the scalp thoroughly during shampooing. 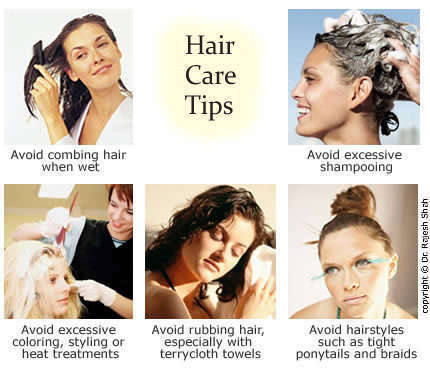 :: Excessive shampooing can strip vital minerals like calcium, phosphorus, nitrogen, and iron from the hair. :: After washing hair, dry it by blotting the hair with a towel. Avoid rubbing, especially with terrycloth towels, as this will pull hair when it is in a weakened state, due to the wetness. :: Excessive coloring, styling or heat treatments, and chemical treatments can damage hair and cause breakage even when directions are followed. :: Another styling caution is against the overuse of hairstyles that pull the hair too tight, such as ponytails and braids, which will cause hair loss especially along the sides of the scalp. This syndrome is called traction alopecia.